Often rooms have to be monitored from the outside due to no direct access and the observation has to be effected by systems hardly to detect. 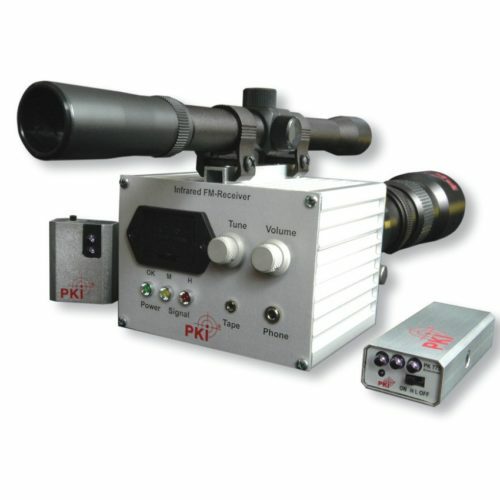 For this purpose the PKI 3200 Infrared Observation System offers the right choice. Due to its infrared light – which is completely invisible to human eyes and beyond the range of any RF scanner or radio receiver – this device perfectly meets all requirements. The system consists of an optical receiver with pinpointed telescope, a tripod for mounting the receiver and two different transmitters for room observation. One transmitter is featuring a built-in microphone while the other one comes with a contact microphone which operates like a stethoscope to listen through walls, windows etc. The receiver is equipped with a tele-lens which allows looking into rooms from a distance of approx. 300 meters.